Yesterday, we got a look at Disney XD and the Disney Channel's special Star Wars: The Force Awakens preview from London, which featured their own local host. Today, we have the American version. And it contains almost exactly the same footage, only with a different host who hails from the U.S. We don't really get to see too much behind-the-scenes footage. 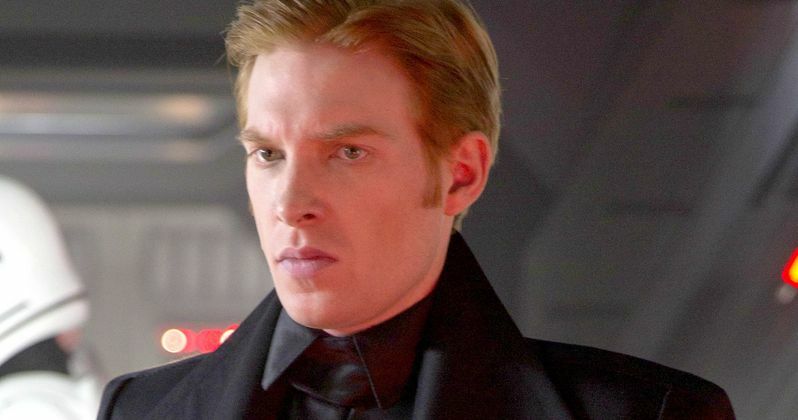 But we do get a few select new scenes, the coolest of which has a better look at Domhnall Gleeson as General Hux. We see him aboard a Star Destroyer as he yells, 'Fire!' This cuts to the underside of his ship as a blaster canon sends two missiles flying after an unidentified ship. The Disney XD host describes the new movie as such. "The Star Wars galaxy is a dangerous place. Epic Battles. Remote worlds. Strange creatures. And deadly threats at each turn. A long time ago a group of heroes banded together to save the galaxy from an Evil Empire. A dark new threat promises to destroy everything they've fought for. Now it's time for a new generation of heroes. Rey, a scavenger searching for answers. And Finn, a rogue Stormtrooper looking for something to fight for. They team up with a mysterious droid named BB-8. These three must make a choice. Continue their journey alone. Or work together to defeat the dark side." This latest Star Wars 7 preview also offers up a few quick looks at the main trio of heroes Rey (Daisy Ridley), Finn (John Boyega) and Poe Dameron (Oscar Isaac) along with their Astro-mech droid BB-8. We also get to see Han Solo (Harrison Ford) aboard the Millennium Falcon. There is some never-before-seen interaction between Rey and BB-8, and we get to see Finn take control of the Falcon's blaster canon. This video also gives us a closer look at one of the new alien creatures from Star Wars: The Force Awakens. While we don't know this creature's name, or where it comes from, it was one of the many unspecified aliens seen in the Vanity Fair photo shoot that debuted back in May. This footage also represents the first time we've heard Poe Dameron speak. Not only that, he delivers one of the most iconic lines of dialogue in the entire franchise. While it isn't the most extensive sneak peek, there is plenty of new footage to check out. The cast includes John Boyega, Daisy Ridley, Oscar Isaac, Adam Driver, , Harrison Ford, Carrie Fisher, Domhnall Gleeson, Lupita Nyong'o, Gwendoline Christie, Andy Serkis and Max von Sydow. J.J. Abrams directs Star Wars: The Force Awakens from a script he co-wrote with Lawrence Kasdan, with the director producing alongside Kathleen Kennedy and Bryan Burk. Take a look at the Disney XD UK promo, and stay tuned for more on Star Wars: The Force Awakens, in theaters December 18.